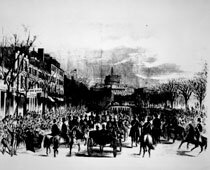 Abraham Lincoln on his way to the Capitol for his inauguration, published in Frank Leslie’s Illustrated Weekly, March 16, 1861. Courtesy of the Abraham Lincoln Presidential Library and Museum. Fear of violence hung in the air. Just two weeks earlier Jefferson Davis had taken the oath of office as president of the Confederate States of America. Soldiers blocked off the cross streets and sharpshooters manned the roofs along Pennsylvania Avenue. The unfinished Capitol dome loomed in the background as if to symbolize the uncertain state of the nation. 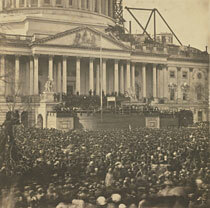 Lincoln began his inaugural address by appealing to Southern secessionists. He promised to defend states rights and protect slavery where it existed. But he made it clear that he would defend the Constitution and the Union. He ended his speech with a plea to find common ground. To some Northerners, his remarks seemed to be too conciliatory, but to many people in the South, they sounded like a declaration of war. 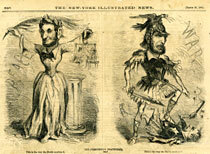 Thomas Nast’s cartoon, published in the New York Illustrated News, March 23, 1861, captured how different audiences received Lincoln’s address. "In your hands, my dissatisfied fellow countrymen, and not in mine, is the momentous issue of civil war. The government will not assail you. You can have no conflict, without being yourselves the aggressors. You have no oath registered in Heaven to destroy the government, while I shall have the most solemn one to 'preserve, protect and defend' it. "I am loath to close. We are not enemies, but friends. We must not be enemies. Though passion may have strained, it must not break our bonds of affection. The mystic chords of memory, stretching from every battle-field, and patriot grave, to every living heart and hearthstone, all over this broad land, will yet swell the chorus of the Union, when again touched, as surely they will be, by the better angels of our nature." On the morning after his inauguration, Lincoln received a report that the garrison at Fort Sumter, in Charleston Harbor, South Carolina, would soon be forced to surrender unless resupplied. The Confederate government laid claim to the fort, and looked on reinforcements or new supplies as an act of war. But surrendering the fort would only strengthen the secessionists’ cause. After much debate, Lincoln decided to send provisions, but not arms. The supply ship never reached the fort. On April 12, 1861, Confederate forces responded with a 34-hour bombardment that ended in the garrison’s surrender. Three days later Lincoln issued a proclamation calling for 75,000 volunteers for the Union army. "Of all the trials I have had since I came here, none begin to compare with those I had between the inauguration and the fall of Fort Sumpter [sic]. They were so great that could I have anticipated them, I would not have believed it possible to survive them." - "Come and Join Us Brothers"